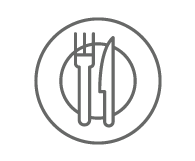 Restaurants are establishments that provide food and drinks in exchange for money. Every locality has atleast one restaurant. With so many restaurants, cropping up you could be spoiled for choice. How do we choose a restaurant? The primary factor is your food preference. Other factors that make you decide over a particular restaurant include, location, seating, décor, ambience, staff, service and budget.